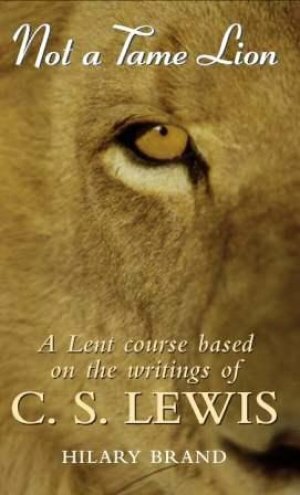 Not a Tame Lion - a Lent course on C S Lewis' Narnia films by Hilary Brand. The Narnia films give you a compelling opportunity to open up the Bible using the popularity of the films and their underlying Christian message. Movie lovers who might never otherwise open the Bible, never mind attend a Lent study course, will be attracted to a discussion group centred on the movies and on the bio-pic of their author, C S Lewis. Hilary Brand’s Lent course ‘Not A Tame Lion’ builds on the wide appeal of two Narnia films: ‘The Lion, the Witch and the Wardrobe’ and ‘Prince Caspian’ together with the moving film of C S Lewis later life ‘Shadowlands’. Using scenes from all three movies, ‘Not A Tame Lion’ gives you a weekly look what’s really going on in the stories and throws down the challenge to take it further. ‘Not A Tame Lion’ gives you the outline and leader notes for five sessions of watching extracts from the films, talking about them and using these discussions to open up the Bible and their big Christian themes. Each of the five sessions – one for each week of Lent includes an author’s introduction, a recommended film scene and questions for the group to discuss. Extra ideas and material for private exploration let you keep the group focussed throughout the week until your next meeting. Five group discussions explore themes of suffering, God’s absence and the gift of the present in Christ. They delve into God’s apparent absence and the gift of the present moment. Looking deeper into Lewis’ insightful writing, Hilary Brand’s notes use the films to explore even the difficult ideas of heaven, judgement, and the force of evil. A bonus session - “Living in a sceptical age”, sensitively explores an approach to the disbelief of others and how to deal with our own personal doubts. For experienced Christians, following ‘Not A Tame Lion’ as a Lent course is a reminder that God is not to be contained by the constraints and limitations Christians would put on him: “We would all like a religion that kept us within our comfort zone. But just as the Aslan of the Narnia stories is not a tame lion, neither is the Christ of the Gospels always a comfortable Saviour, saying things that are often unexpected and challenging. This year, the Bishop’s Lent Appeal hopes to aid the plight of unaccompanied child migrants in the Calais area. These youngsters have been reduced to sleeping rough in the open since the closure of the refugee camps last year. They are extremely vulnerable. Being able to get out of the cold for a while and talk to a friendly face, to have help to understand the administrative system, to have help with language learning or other practical skills are all tasks that our fund could help with. Helping with these could make a world of difference to the lives of the stranded migrants in the Calais area. Some facts: The plight of the many migrants from the horn of Africa and the Middle East, including many children without accompanying parents, who have ended up on the north coast of France is repeatedly in and then out of the news. When the news cameras move on elsewhere they do not cease to exist. If anything their plight is worse than when they are in the spotlight of media attention. The Calais Jungle Camp which was demolished in October 2016 may no longer be there, nor the official refugee camp which caught fire in Dunkirk, but the number of migrants subsisting in the surrounding area sleeping out under the trees or the stars has hardly changed. Valiant volunteers from France and Britain struggle to meet the most basic needs of these migrants (with generously donated food, clothing & blankets). But what they and the migrants themselves are urgently seeking is human warmth and hope. Please do consider how you can support my appeal. I wish you a holy and spiritually fulfilling Lent. You can give money to this appeal through your church treasurer, who will forward money to the diocesan office or email Nick Wraight, in the diocesan finance office.